That means it’s time to bundle up before you head outdoors, and if you’re exercising, make sure you’re spending extra time for the warm up. Often in the colder months it takes longer for our muscles and joints to ready for the day. Joints become stiff and immobile without regular movement and often take longer to stretch and lengthen. I know it’s harder to get up an extra 10 minutes earlier with the days already being so dark, but making the effort to give yourself, your mind, and your body ample time to EASE into the day and get some heat started is so much better than suffering an injury or jumping into the day cold turkey. 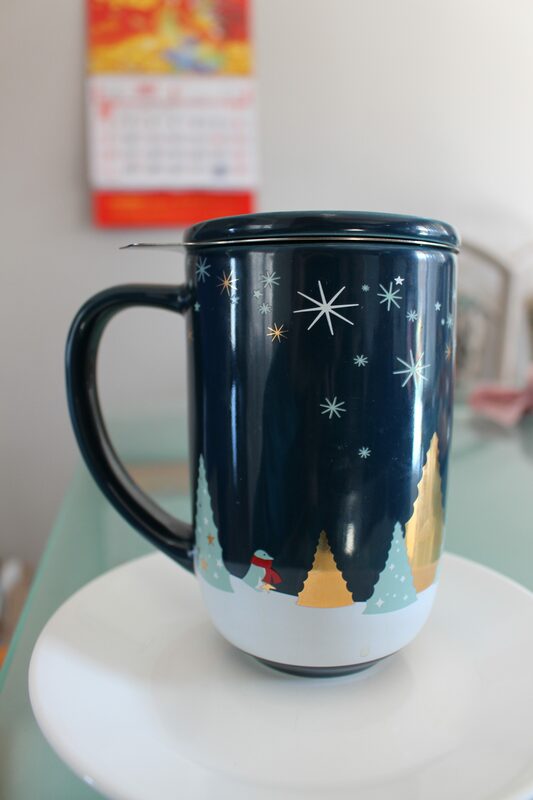 It’s time to whip out those Christmas mugs. And Christmas teas! I’m thinking about Sugar cookie sleigh ride, anyone? 2:30-rest of the day: slow down, get homework done leisurely. 1-6 homework, run errands, take a walk, meditate. Meet with a few friends stress relief. Evening stretch and check in with agenda; evaluate this week and set intentions for following week. I admit, during rehearsals it was challenging to keep myself accountable to this plan because I was either too busy or not in the mood at all to do any of these things. I distinctly remember pressing snooze 3 times when my alarm rang one morning instead of getting up to prep for the day. I want to say that 90% of the days I did get in some sort of activity, whether that be a run before class or some weight lifting after classes, but all the days I always slept around 12am because when I got home it takes me a while to get unsettled and then carried away on my cellphone for a little bit. A few of my workouts have sucked because my mind was racing with worries about keeping up with academics all the while memorizing my script, and worrying that I would be a good “actor” in rehearsals. Sundays and Saturdays I didn’t end up always getting to do my beloved long run like I longed to because I felt guilty about NOT doing schoolwork. I also couldn’t find any friends who wanted to hang out; so that made e feel lonely and unwanted. But I put all my grief and frustration into doing essays and readings and spent a lot of time with my head in a book or on the screen and sometimes got a headache; looking back, I think I should have taken breaks in between to be with nature so I came back more refreshed. I want to incorporate some more time for yoga and meditation into my usual routine, but first I will let myself get used to the nonrehersal schedule so I can calm down and get my thoughts organized as I start into a fresh chapter of my semester. I plan to do this on Sunday or Saturday evenings, and I miss my running! I want some time to explore this one route I discovered near ________ park; it was so beautiful but last time I got there I was anxious that I would get lost if I went too deep so I turned back around without further exploration. I think what it is I need is a doppleganger. One to do all the work and the other to relax and have fun. I think what I need is to spend more time in nature. Honest to god–especially around fall time, my favourite love (haha, and probably the only romantic relationship I’d have in my life…) I want space to day dream and get sentimental and feel the cold crisp air. I need to stop feeling guilty (for not doing work) and lonely and unwanted (for getting rejected–I feel like an old soul and sometimes don’t vibe with my peers…). I don’t want to exist–I want to thrive in life. Any comments/insights, ____? On this, or anything about me, or just your own random thoughts. Hi __________, here’s my plan. Since last assignment, I have been spending time both indoors and outdoors. My goal originally was to spend more time outdoors than indoors to ground my in nature and bask in the beauty of the cold weather (I love it so much) but I had to make up the hours that I missed at my part time job due to the October rehearsals for the show…. and it’s in a cubicle. Sometimes I would stand up and stretch as I am on the phones, look longingly outside and imagine the snow falling on my face; bringing a piece of outdoors into the indoors. Baby, it's cold outside and the sun's not up. And it's beautiful and perfect for a run. I'll see the sunrise and feel the cold air in my hair, I'll be swept away in the breeze that dances in the trees. Do you enjoy early morning runs? Do you run at all? I’ve been running consistently about 4 or more times a week (depending on my sleep, energy, and weather) and it literally breaks my heart whenever I can’t run because it brings me so much joy. Especially cold weather season. I’ve still yet to incorporate more yoga, but I did get in a stretch and meditation one of the weeks last week. It felt so good; I slept like a baby that night. Over the break I plan traveling alone for the first time in my life. My heart is calling on Europe (if that’s possible!). I’ll go for 1 week. Maybe I’ll do a dance DVD again to learn a combination? I won’t be running as often due to the snow outside so I’ll do some yoga indoors. I also want to start the dance activity you assigned us for next semester–maybe hip hop or something Latino. Overall, I don’t have a lot planned for movement/fitness over the break because I’d like to be preoccupied with traveling and the festivities. With that being said, I know my body will thank me by at least stretching and dancing and feeling the daylight on my skin. I’m also prone to Seasonal Affective Disorder, so exercise alleviates some of that. I love the cold and snow, so maybe I’ll find lots of joy in sitting outdoors journaling or singing. Are you traveling this season? What workouts are you doing now that it’s colder outside? What’s your favourite style of dance? This entry was posted in The Private Diary of an Actress in Training, Uncategorized.